This recipe marks a special occasion...Too Precious For Processed is turning 3! This past year has been such a whirlwind of events that this milestone almost slipped by me. Notice how I said "almost." Ultimately, it didn't because that would be like forgetting your own child's birthday, and who does that? It has been another incredible year of blogging, and with life in general. When I look back at these past 365 days since we last celebrated this anniversary, there are so many memorable moments, events, and learning experiences I can recall. Plentiful as they may be, I will just breeze over a few of my favorite highlights. Traveling to Japan was an absolute dream! This trip of a lifetime taught me several things. I saw first hand, a country of people who were the most kind and generous group of humans I have ever been around. It was refreshing to see how people were able to live together in harmony, support each other, and help one another, even if it meant a disruption in their day or interacting with someone who may not think, act, or look exactly like they did. You mean, they acted kindly to people who were different than them? Yes! I mean to tell you, without hesitation, the Japanese people would give you the shirt off of their back if they knew you needed it...and it doesn't matter if they know you or like you! Observing their behavior has definitely inspired me to be a better person. Ever since I got back from that trip, I find myself making more of an effort to be a helpful person. Showing kindness to everyone makes me feel good inside. Sure, you could go out of your way on a daily basis to point out every negativity you come across, but it is so toxic to our health and compromises the joy we get to experience in our everyday lives. Being kind to one another is a gift to the giver and receiver. I believe those acts inspire others to do the same. So I'm making a conscious effort not to be that kind of person. Thank you Japan! 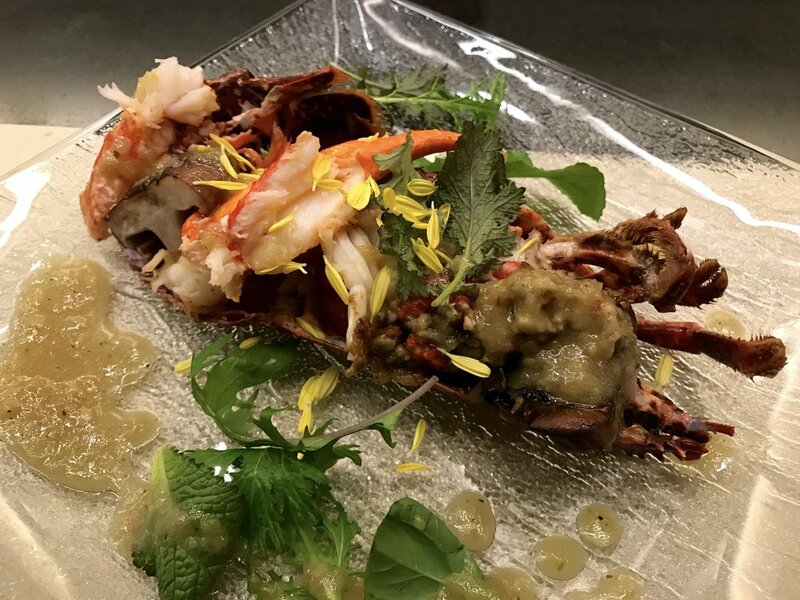 Take a peak at my slideshow of some food highlights! The table is set with all of the necessities. Desserts are a big deal here! This is a soufflé. 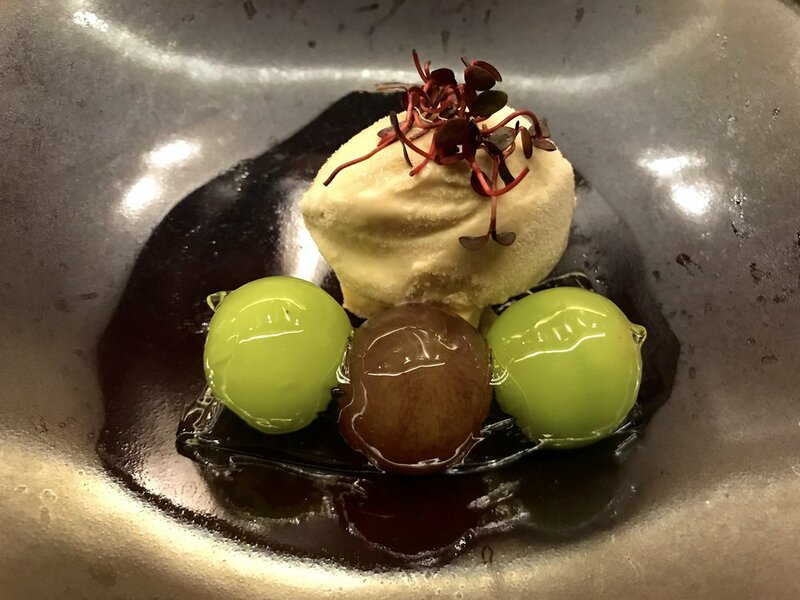 Coffee ice cream with some incredible grapes! Green tea ice cream with red beans. Japanese people also celebrate food in many ways. 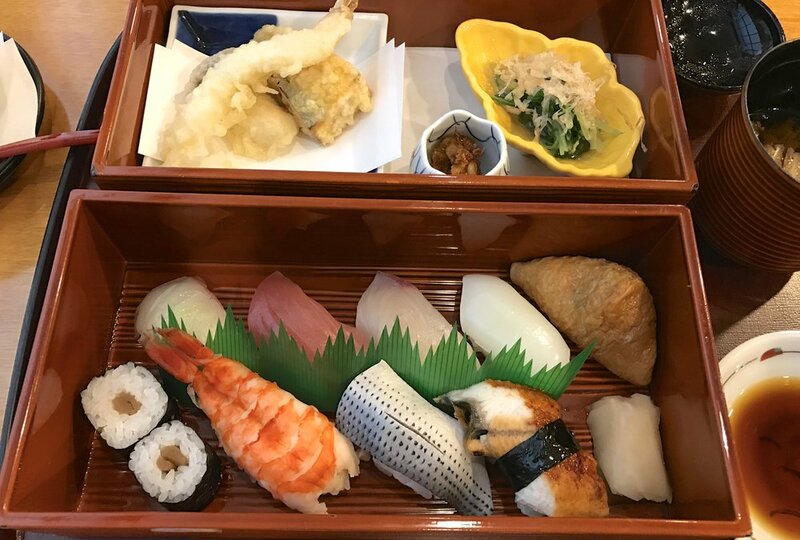 From presentation, to quality, to flavor, and excellent service, you can count on your meals in Japan to be a delightful and an incredible experience. So much love is put into the preparation and you can feel it as well as taste it. 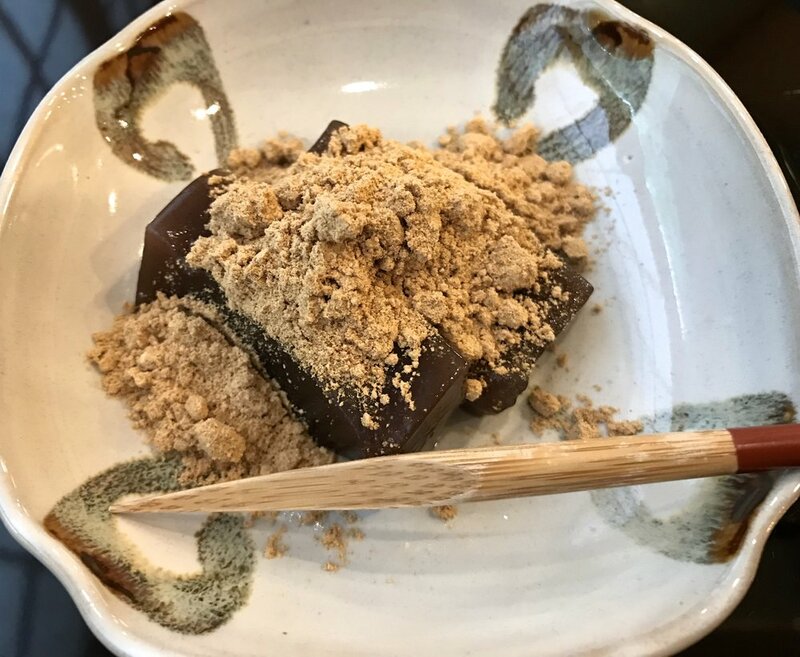 I learned a lot about Japanese cuisine and it certainly was a fabulous treat to enjoy some of my Japanese favorites in their place of origin! I miss so many things about this wonderful country and I'm counting down the days when I return. Originally, we thought we would go again this year, but then another big thing happened to us...we moved! This decision caught us off guard for sure, as this was not something we had been discussing. But one thing led to another and the next thing we knew, we were building a new home and selling our existing one. There was so much craziness involved in the process, I honestly can't even begin to start that story, nor do I want to! But the good news is, we are settled and it really is starting to feel like our home! For several weeks, it didn't. Things were unfamiliar and I felt like I was away at camp. But now I'm home the recipe creating has begun! Well, it really never ended. I just had to tuck everything away in my brain. Probably the last big, memorable event was our youngest son graduating from high school. We are extremely proud of him! Over these past four years, he worked so hard, tried new things, stepped out of his comfort zone, showed bravery & determination, and ultimately, he was successful at achieving his goals. We never had to steer him, never had to nag, never had to do much of anything for him. He was naturally independent and driven to succeed. I'm happy to say his hard work resulted in a fabulous college scholarship along with several other academic honors. So in less than two months, we will be packing him up and moving him into his dorm! He will start a new chapter in his life which he is hoping will lead to "protecting and serving" his community. So as you can see, life has been pretty full around here this past year. Now I want to hear from you. What has been going on in your life over the past year? Have you experienced any major changes? Tell me something fun and exciting? I can't wait to hear all about it! We celebrated another year for the blog, as well as a fantastic year in general, with this yummy dessert. These blackberry & macadamia-nut cream tarts are not only healthy and delicious, but they are easy to make. The filling is pretty much coconut cream with blackberries. Note, you are just using the coconut cream from the can, not the water. I think the macadamia nut flour complements the blackberries perfectly! If you want to swap out the macadamia nut flour for another nut flour (almond, cashew, pistachio, etc. ), you could totally do that. You can also make your own macadamia nut flour by placing some macadamia nuts into your food processor and pulse them until a flour type consistency is created. It won't be an overly fine flour as far as texture goes. And whatever you do, don't over process it or it will become too oily. I love these individual mini tarts. They are perfect for sharing and entertaining. If you prefer to make one large tart, that works too! You could also swap out the blackberries for whatever is in season. Thank you for celebrating this occasion with me and of course I'm humbled and honored to have your continued support. 1. Place two cans of full fat coconut milk in your refrigerator to allow the cream to separate. 2. Mix your crust ingredients in your food processor until a dough ball forms. Divide the dough into 6 balls. Flatten each ball to 1/4 inch thick in a circle large enough to cover the bottom and sides of each tart (5-6 inches in diameter). Then gently lay the flattened dough into each tart, pressing down on the bottom and sides. If you use the same tart pan I did, you will not have to grease it as the crust pops right out after cooling. Bake the crust at 350°F for 10-11 minutes. Note- you can also make one large tart if desired. 3. Open your can of coconut milk and scoop out the coconut cream into a small saucepan. Over low heat, melt it down so it is in a pourable state. Transfer the cream to your high speed blender. Add the berries, maple syrup, and lemon juice. Blend until smooth. 4. Pour the mixture into a large bowl and place it in the refrigerator. I prefer this method to allow the mixture to thicken and cool before pouring into the tart crust. Check the mixture in about an hour and stir well. Once it has the consistency of a thick milkshake, pour it evenly into the individual tarts. Or, if you are making one large tart, just pour it all in your crust. 5. Place the tarts back in the refrigerator for further chilling. In about 1-2 hours, your tarts should be pretty well chilled and solid. Garnish with fruit, fresh mint leaves, shredded coconut flakes, chopped macadamia nuts, etc. The yummy possibilities are endless!